4 Pics 1 Word Man fishing. Fishing trap. Baseball player catching ball. Jump. Trap. Mousetrap. Man catching child. Find the 4 pics 1 word answers you need and still have fun with the game that has hooked millions of people. 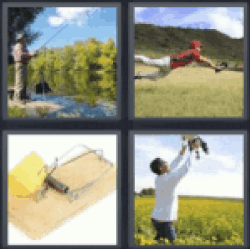 4 pics 1 word man fishing.